@chx – that sounds like a hosting problem to me, check you don’t have a firewall blocking connectivity. Let me know. @Ashley — Thanks for responding. It turns out it was a problem created by one of the e-mail template extension which was declared as stable but didn’t support the magento version I am using. Lesson learnt: don’t take extension description for granted and do check out the respective support forum first. I’ve been using this extension for a while now and it’s worked perfectly. But all of a sudden, about 2 days ago it stopped working. I have no idea how it happened but while I get most emails- I do not get any emails sent by Magento, ie: contact form or copies of order confirms. I don’t know what to do! I tried to switch back to hosting my email with my web host but I can’t get any of the emails that I missed. Can you help me please? Aboslutely nothing changed but I tried uninstalling and reinstalling the extension and it started working again. Sorry bout that- I was getting reallly nervous. Thanks for responding – and thanks for a great extension! I’m switching to AWS now..
problem with DNS stuff… load balancer is not quite working.. can’t get any ping message to come through at all.. Anyway, thanks for the great work mate.. Does this work with multi-domains, multi-website, Magento setups? Need to send from different emails and domains from different shops/websites. Yes, except in admin initiated emails (like admin added orders in the Magento backend) where the ‘store context’ is not correct. I’m looking at options to sort that out with Ben from Blue Acorn currently. Best bet is to try it with your particular setup and see if it meets your needs – if not let me know, because I use it for some multi-store setups, and if there are problems, I’d fix them. I installed your extension with the above instructions however when I run the self-test I get a 404 not found page. Hi, Simon – That is strange, flick me an email with more details and if I get a spare 5 mins today I can have a look at your setup. I’m with a fresh 1.4.1.1 magento setup and i’d like know if your extension are working on it? I’m on 1.4.1.1 but and have installed the extension however I cannot find it anywhere in the admin panel. As a matter of fact the heading ‘system’ does not exist under System > Configuration > ‘System?’ not sure if something has changed in this version or if I’m missing something. Sorry, please ignore my last comment, the extension appears under the advanced section down below, under System > Configuration > Advanced > System. Works wonders and i’m in love! Keep it up! Thanks for the great app. Hello. I Just Installed The Plugin And in the following test worked fine. But when i try to send a email to a friend in the store it simple doesn’t came. @Philipe Cardoso – try enabling logging and then paste the log output of simple test and also contact form, forgot password etc. The form i forgget my password works with your plugin on or off.. But the newsletter doesnt work. Do you have other extensions installed? Check your log output during newsletter send. First of all, thank you for making this great plugin. I recently installed it on 1.4.1.1 and I’m getting a 404 error when I run the self test (for what I read in the comments, someone had the same problem). have seen your extension running in a older magento version, great stuff! But as Daniel i try get your 1.3.4 (beta) running on a magento 1.4.1.1. Selftest and Maillog end in 404. Even my smpt config values are not stored. Can you help us out please? Thank you! I have earlier used your contribution. native Magento MageCore_Model_Email_Template is overridden by Aschroder_GoogleAppsEmail_Model_EmailTemplate that could not parse passed variables correctly. Is this correct? Does your script override some original magento templates? And if it does, how can i get the original templates back. I uninstalled your contribution, but it didnt work..
Just to be clear the term ‘override’ in this context is the Magento extension capability to replace certain core functionality, not to actually change the core files at all. So yes, it does override, in fact most extensions that do _anything_ will override core functionality. It does not change any templates however, it overrides a Core class called Template. If you uninstall the extension (and clear your cache) then there will be no trace of the extension left behind (except an email log table). Once properly uninstalled you should not see this folder in app/code/Aschroder/SMTPPro and then your helpdesk extension will work as normal. You may not be able to actually send emails though (that may be why you installed my extension in the first place). In which case you either need to merge the capabilities of the extensions, or find an email solution that is compatible with the helpdesk extension. btw it does not generate an email at any point!!! hi, i just installed this extension because i couldnt send any emails and i have this problems. but in my inbox i find two emails “contact form” and “test email” so i thought it was working. could you try to help me please? @esteban Seems like two errors there. 1) the table did not get created, try uninstalling and reinstalling? 2) the headers error, I have had someone else report that, I’m not certain it is related to my extension, I’ll look into it more. I see that exception thrown in a Zend core class. Do you have any other email related extensions installed? I had same SQL error as you , found this thred via Google. I sorted it by changing permissions i.e. 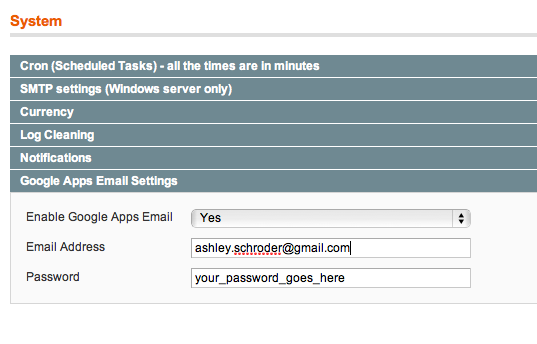 chmod 777 recursive, then log out / log in & let Ashley’s app do it’s stuff which is create the missing table. Tidy up the permissions afterwards as always. I’m pretty sure I’ve entered my account information correctly and I’ve tried several gmail / google apps accounts I have access to. Never mind. I didn’t realize I had to click ‘Save Config’ before running the Self Test. It points to a possible extension clash – some other extension is controlling the email send. Check the contact form test email headers, if it is sent via Google then it is probably a false alarm. When I was using default magento sending system, client who buys a product receive an email, but I am (as owner) not receiving anything. Installed your extension (in manual way), filled fileds with google apps data but now there are no emails for client and not for owner (tried with contact form, with purchase orders). Tried with another simple smtp data (not google apps) – same problem continues again. BUT when self-test are done (with google apps, smtp google apps and simple smtp data) everything looks good and I am getting test emails (test email and contact form example with your email). Using magento 1.6.0.0, website is not in production state and all requests for that domain are redirected. My server (virtual dedicated) isn’t configured to send emails itself. Maybe there is a problems? P.S I have already used your extension in previous project and you helped me to solve another problem few months ago. I need your help now too, I am ready to make a donation for you work. Would this be a good fix or workaround for my magento installation not sending emails to my gmail apps account or do I have something else going wrong? Hi, and thanks for a nice extension! I wonder if its normal to get all sent messages in the gmail inbox to, not only in sent messages..
Is there any settings that changes this? It is not working. I am usinn magento 1.4.1.1 and your extension 1.4.3. I send you the test message, so eventually you can help me out fix it. Thanks for this amazing extension, it really do all the work for us on a blink! Could you help us showing the right direction, please? Do you have any plans to update this extension for compatibility with Magento version 1.7? Set “Choose extension option”: “Google Apps/Gmail”, and them It works.